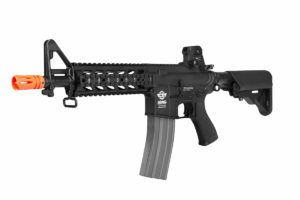 Product Description: The G&G M4 Combat Machine 16 Raider AEG rifle is one of, if not the, best entry-level and even mid-level airsoft guns in the game. At around $150 USD, this carbine is an affordable yet durable rifle, very highly modifiable, and Tokyo Marui compatible. The rifle body is hard plastic, but will hold up to wear, tear, and abuse. The CM 16 features an impressive 450 round high capacity magazine, and the rifle has semi-automatic and fully automatic firing modes. The only serious drawback to the CM 16 Raider is that because it is such a high-value rifle for its price, it is extremely popular, especially for low-budget or entry-level players. As a result, this rifle tends to fly off the shelves, so it can be difficult to find them in stock. At the local indoor airsoft [field?] I play at, which has a lot of casual players and younger players with lower budgets, the G&G M4 Combat Machine 16 Raider is one of the most commonly used, and in demand, rifles on the field. I constantly hear other players asking if I’d be interested in selling my CM16 Raider or if I know where to get one like it. I use the CQB version of the rifle myself as it is a smaller field, and I also like to get up close and personal behind enemy lines. I find the CQB Raider perfect for maneuvering around barricades and cover. It’s lightweight design and CQB size allows for easy snap-aiming and hip fire when necessary. The G&G M4 CM16 Raider stock version isn’t a lot different from the CQB version, but as opposed to the CQB version, it is designed for outdoor matches and MilSims, and it truly excels at it. The stock CM16 Raider has a slightly longer barrel and flash hider and has a very slight increase in muzzle velocity. You will not find a better value rifle or a better starter investment on the field. For around $150 USD, the G&G Combat Machine 16 Raider is extremely durable, can take a good amount of abuse, and despite it all it is a light weapon at just over 5 pounds. It is customizable, Tokyo Marui compatible, and as an M4, you will find plenty of upgrade and replacement parts for it available. It even has a 450 round high capacity magazine, and takes a 9.6V Nunchuck battery that lasts a lot longer than you expect it to, another tally in the “pro” column for newer players. As you get more involved in the sport, you will find that the upgrades and mods you need will be easy installations on the CM16 Raider. If you are looking for a starter rifle or a higher-tier, lower-budget rifle, this is it. The G&G M4 Combat Machine 16 Raider has good, metal internals and a version 2.0 gearbox. It is ergonomic, agile, and lightweight. It features an adjustable hop-up, so that you can tweak the backspin on your BBs as you get more acquainted and confident with your rifle. 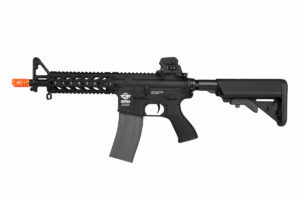 The CM16 features an 8-inch M-LOK handguard that allows you to adjust the position of the rail segments and iron sights. The iron sightsalso easily flip up and down as you get closer to your target, or want to protect your rails and sights when transporting the gun. Another thing that is great about the CM16 Raider for starter players is how easy it is to adjust, tweak, and calibrate quickly or even on the fly. The crane stock is fully adjustable. Disassembly of the gun is incredibly easy, another huge tally for the pro column for players who are new to the game. Cleaning, maintenance, and upgrading the rifle are also downright simple. There aren’t a lot of cons for this rifle. The one major downside to the CM16 Raider is that because it is so popular, it can be very difficult to find. You will find that, when you do find it in stock online, there will be little to no reviews for that particular seller or version of the rifle. This is because if people had found it and reviewed it, it would fly off the shelves. While the magazine loading is ambidextrous, the firing mode and safety selector are not if you are a lefty. The front triangle sight is fixed to the outer barrel, which is one of the few components of the rifle that is not easily adjusted or swapped out. The barrel, hop-up and hop rubber could stand to be upgraded; any rifle at this price range has to save money on at least a few areas. If you are considering upgrades or mods in the future to optimize performance, consider replacing these parts. 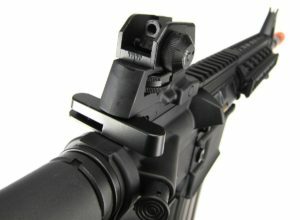 Here are a few of the small complaints I have heard about the CM16 Raider on the field. While some players don’t have a problem, others say the front sling adapter is somewhat weak, compared to the durability and ruggedness of the rest of the rifle. While most players have no problem buying new magazines or switching out mags with other guns, despite being TM-compatible, some have complained that the CM16 rifle doesn’t easily swap out magazines with other rifles, especially mid-capacity magazines. There have been some complaints that the gun did not fire out of the box, or that it wasn’t properly lubricated, resulting in misfires, dry fires, and ammo loading issues (consider purchasing silicone lubricant with the rifle). A few other players have mentioned that the paint comes off with heavy use. I’ve also hears of problems with the battery cables getting caught when collapsing or extending the stock, as the battery is a little awkwardly placed. The most common complaint I have heard, and usually from players that “didn’t read the description,” is that the battery was not included, which is also pretty common with AEGs, so make sure you are purchasing a battery and recharging kit with the CM16 Raider. We recommend 9.6V Nunchuck batteries – 8.4V batteries should also suffice – and a smart charger to avoid overcharging. If it isn’t obvious, overall, we highly recommend this rifle for starter players or players on a budget. You will find that most of the internet will agree with you (just try searching Google for this rifle, and the “out of stock” and 4- and 5-star reviews will confirm this). Fortunately, AGG always keeps an eye on the stock of our airsoft partners, and we will always do our best to refer you to a retailer that has the CM16 Raider ready to deliver to you! when i first started out i grabbed the last CM M4 Raider 16 they had at local airsoft shop in Poznań. still using it today! got it fully decks out now with scope, new motor, new barrel and laser sight but it still work good as first did when i bought it 2 years ago! great gun to have, definitely great gun for starting out!